HAWKES LEARNING SYSTEMS Students Matter. Success Counts. Copyright © 2013 by Hawkes Learning Systems/Quant Systems, Inc. All rights reserved. Section 12.2. 4 The Theory behind it. Bluman, Chapter 10 4 Best fit Best fit means that the sum of the squares of the vertical distance from each point to the line is at a minimum. 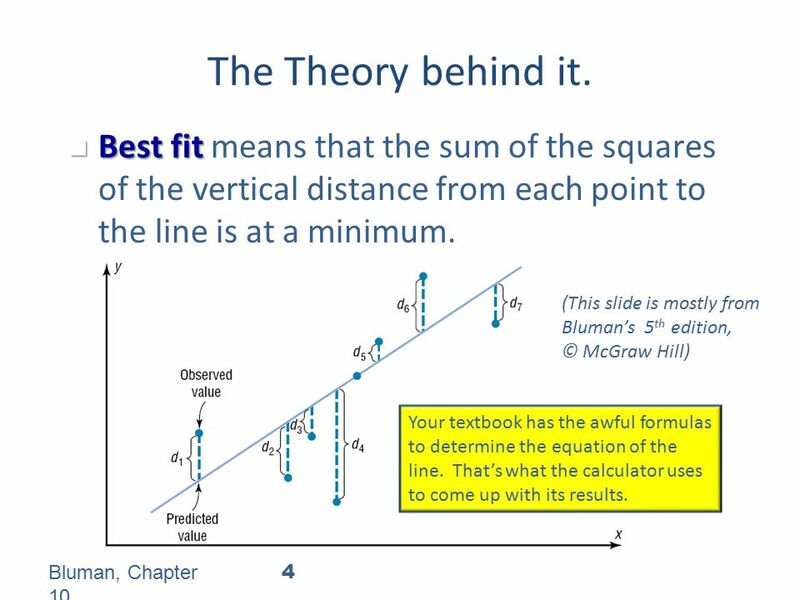 (This slide is mostly from Bluman’s 5 th edition, © McGraw Hill) Your textbook has the awful formulas to determine the equation of the line. That’s what the calculator uses to come up with its results. 8 HAWKES LEARNING SYSTEMS Students Matter. Success Counts. Copyright © 2013 by Hawkes Learning Systems/Quant Systems, Inc. All rights reserved. 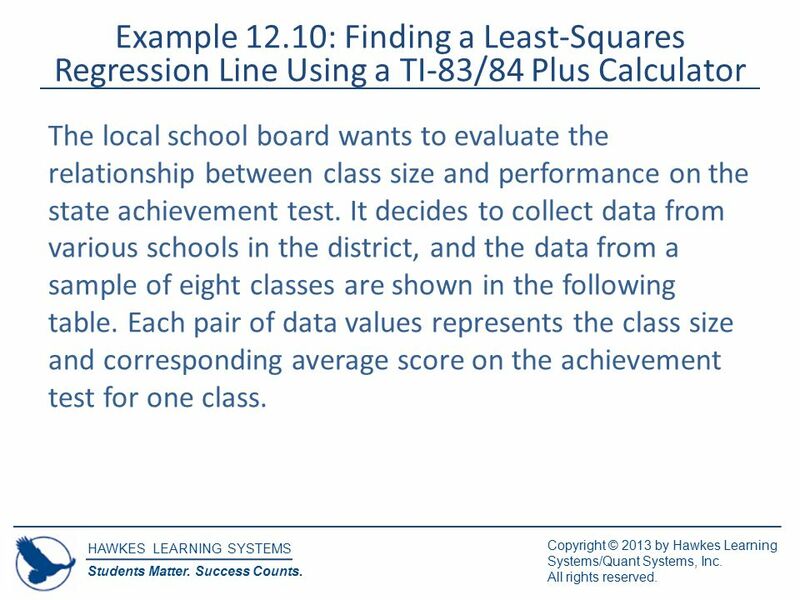 Example 12.10: Finding a Least-Squares Regression Line Using a TI-83/84 Plus Calculator The local school board wants to evaluate the relationship between class size and performance on the state achievement test. It decides to collect data from various schools in the district, and the data from a sample of eight classes are shown in the following table. 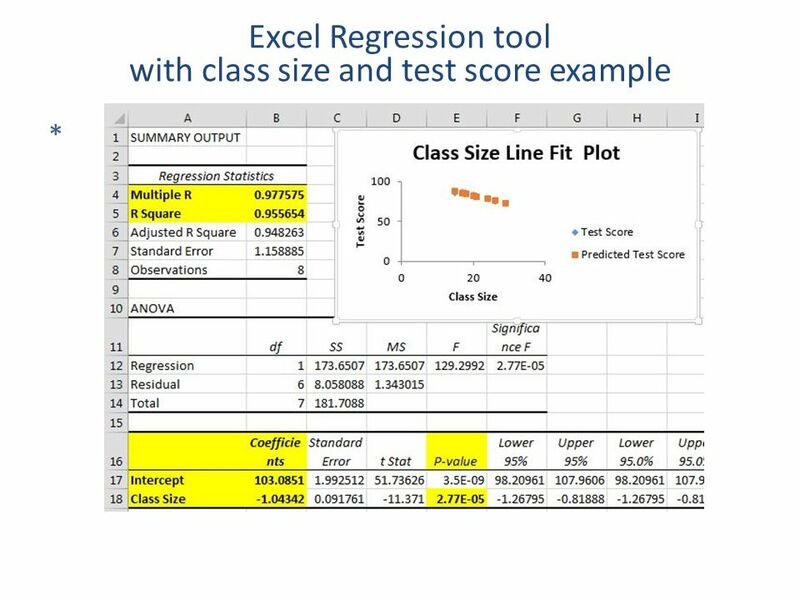 Each pair of data values represents the class size and corresponding average score on the achievement test for one class. 9 HAWKES LEARNING SYSTEMS Students Matter. Success Counts. Copyright © 2013 by Hawkes Learning Systems/Quant Systems, Inc. All rights reserved. 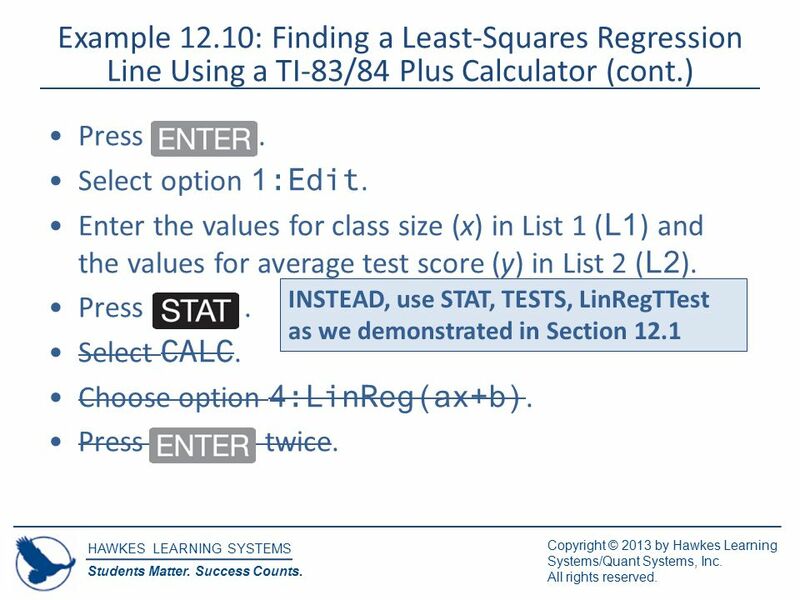 Example 12.10: Finding a Least-Squares Regression Line Using a TI-83/84 Plus Calculator (cont.) 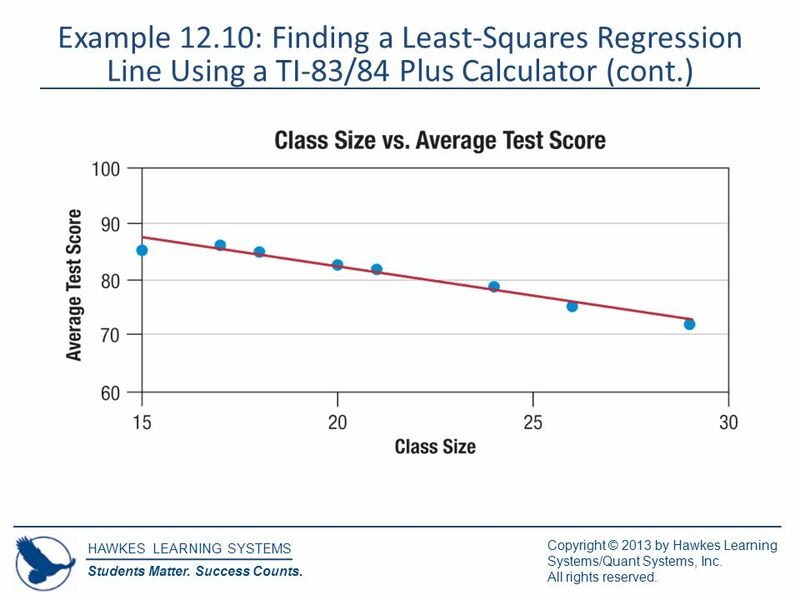 Class Sizes and Average Test Scores Class Size1517182021242629 Average Test Score85.386.28582.781.978.875.372.1 Determine if there is a significant linear relationship between class size and average test score at the 0.05 level of significance. If the relationship is significant, find the least-squares regression line for these data. 10 HAWKES LEARNING SYSTEMS Students Matter. Success Counts. Copyright © 2013 by Hawkes Learning Systems/Quant Systems, Inc. All rights reserved. 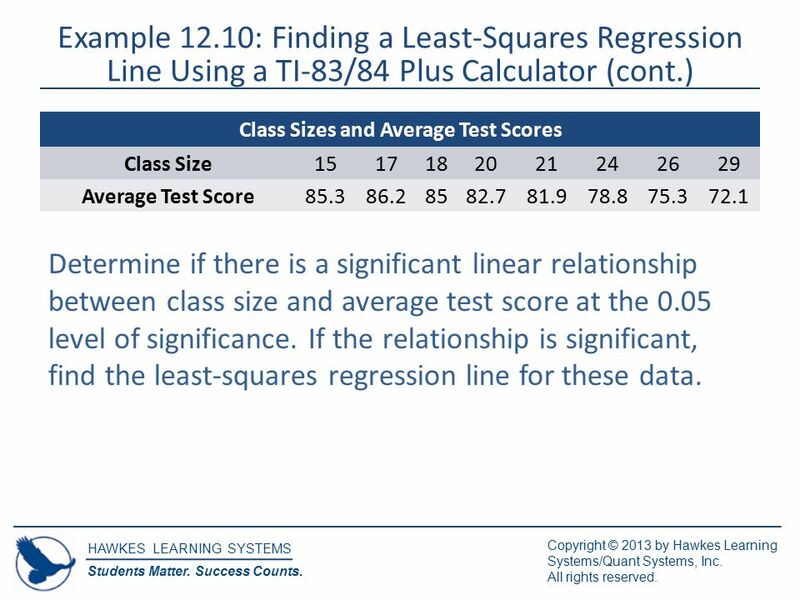 Example 12.10: Finding a Least-Squares Regression Line Using a TI-83/84 Plus Calculator (cont.) Solution First, we must decide which variable should be the x-variable and which variable should be the y-variable. Consider whether there is a possibility that one of these variables influences the values of the other. In this case, we are interested in the possibility that class size influences the average test score. 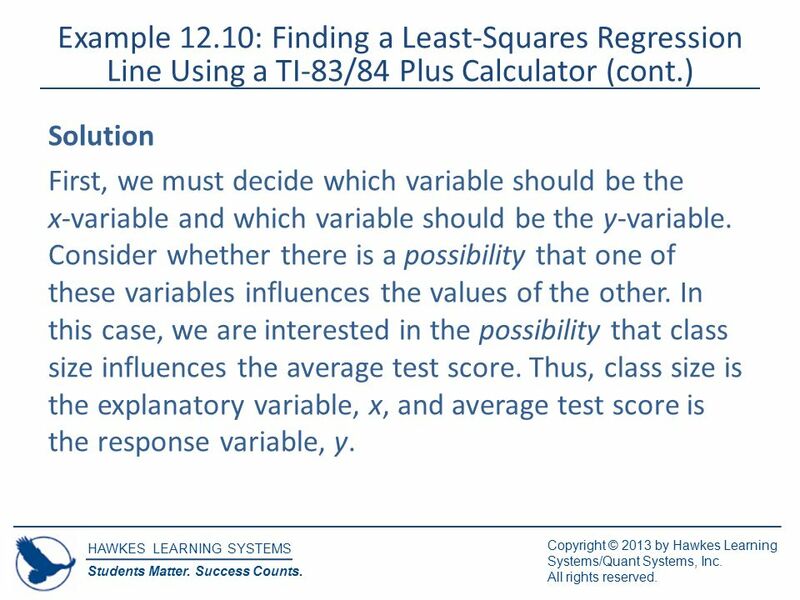 Thus, class size is the explanatory variable, x, and average test score is the response variable, y. 13 Example 12.10 Outputs Do we have a significant linear relationship here? 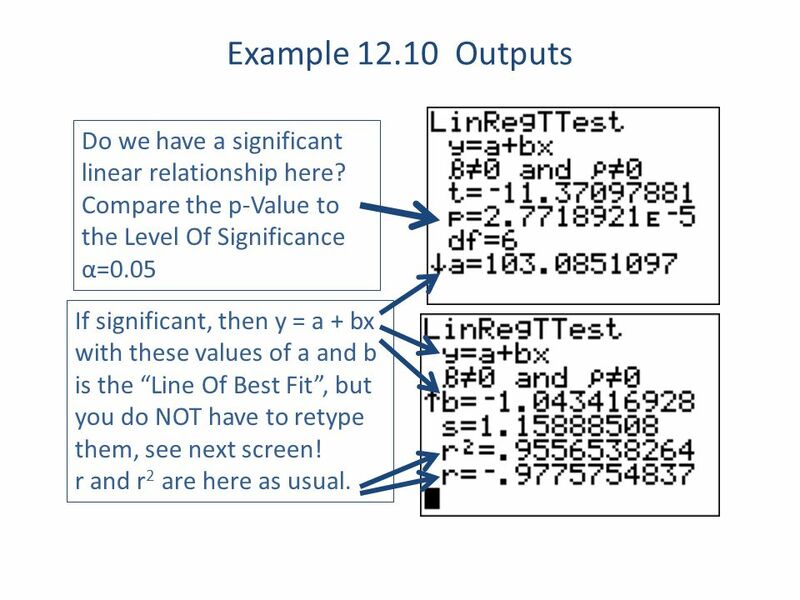 Compare the p-Value to the Level Of Significance α=0.05 If significant, then y = a + bx with these values of a and b is the “Line Of Best Fit”, but you do NOT have to retype them, see next screen! r and r 2 are here as usual. 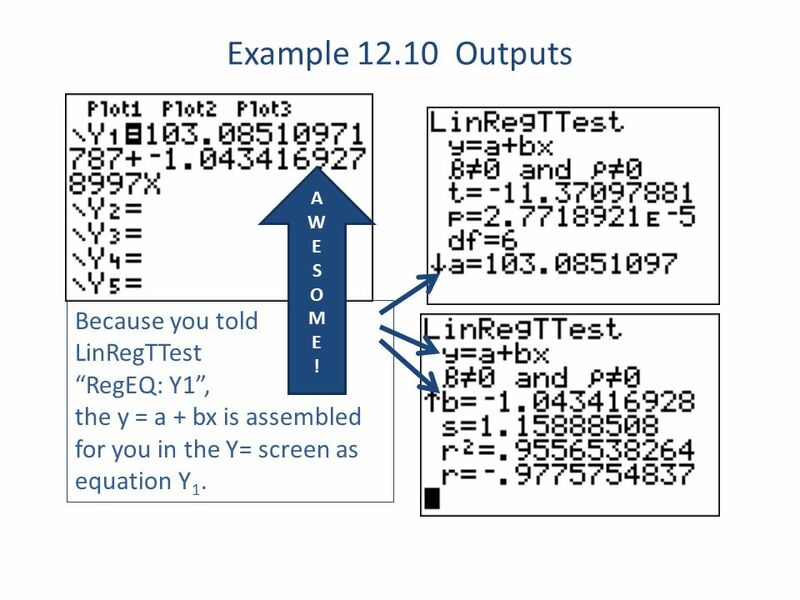 14 Example 12.10 Outputs Because you told LinRegTTest “RegEQ: Y1”, the y = a + bx is assembled for you in the Y= screen as equation Y 1. AWESOME!AWESOME! 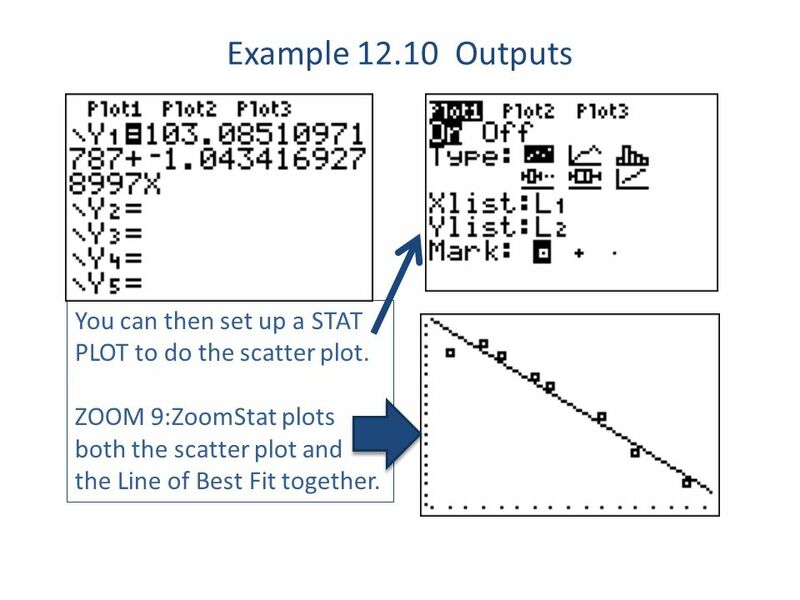 15 Example 12.10 Outputs You can then set up a STAT PLOT to do the scatter plot. ZOOM 9:ZoomStat plots both the scatter plot and the Line of Best Fit together. 16 HAWKES LEARNING SYSTEMS Students Matter. Success Counts. Copyright © 2013 by Hawkes Learning Systems/Quant Systems, Inc. All rights reserved. 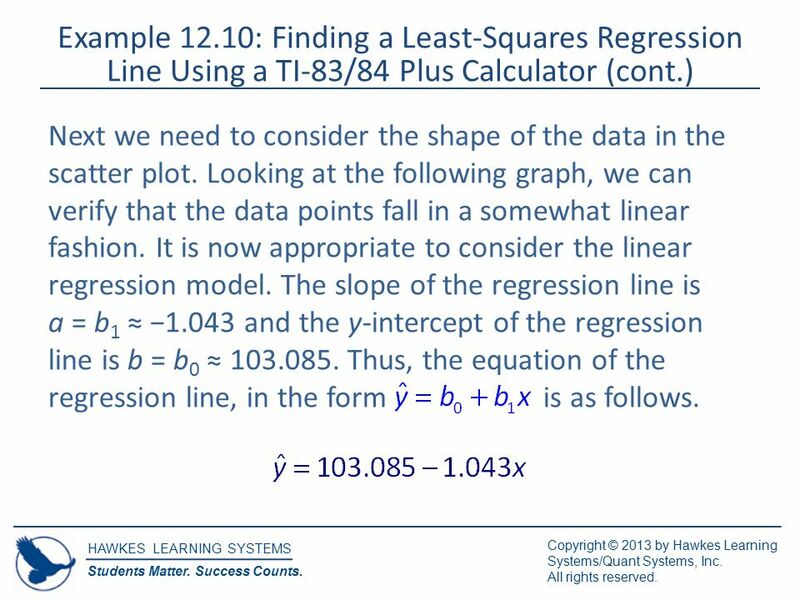 Example 12.10: Finding a Least-Squares Regression Line Using a TI-83/84 Plus Calculator (cont.) Next we need to consider the shape of the data in the scatter plot. Looking at the following graph, we can verify that the data points fall in a somewhat linear fashion. 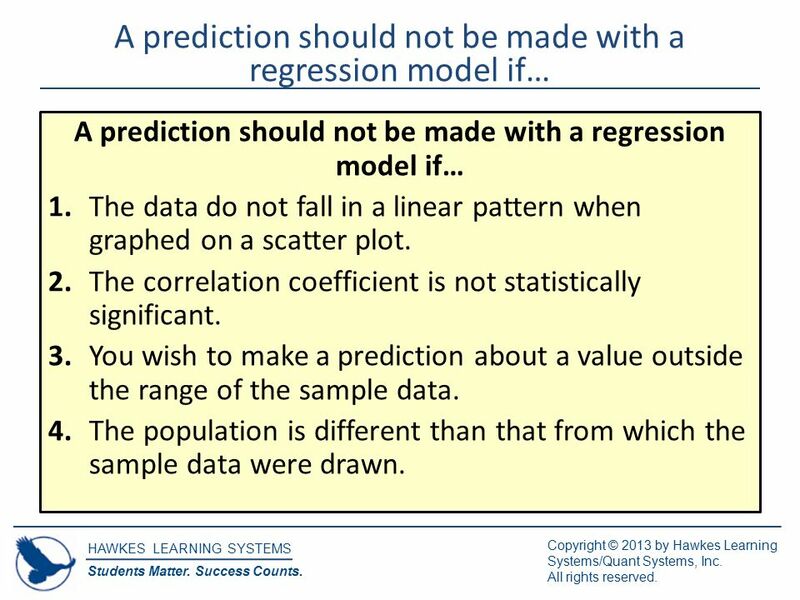 It is now appropriate to consider the linear regression model. The slope of the regression line is a = b 1 ≈ −1.043 and the y-intercept of the regression line is b = b 0 ≈ 103.085. Thus, the equation of the regression line, in the form is as follows. 18 HAWKES LEARNING SYSTEMS Students Matter. Success Counts. Copyright © 2013 by Hawkes Learning Systems/Quant Systems, Inc. All rights reserved. 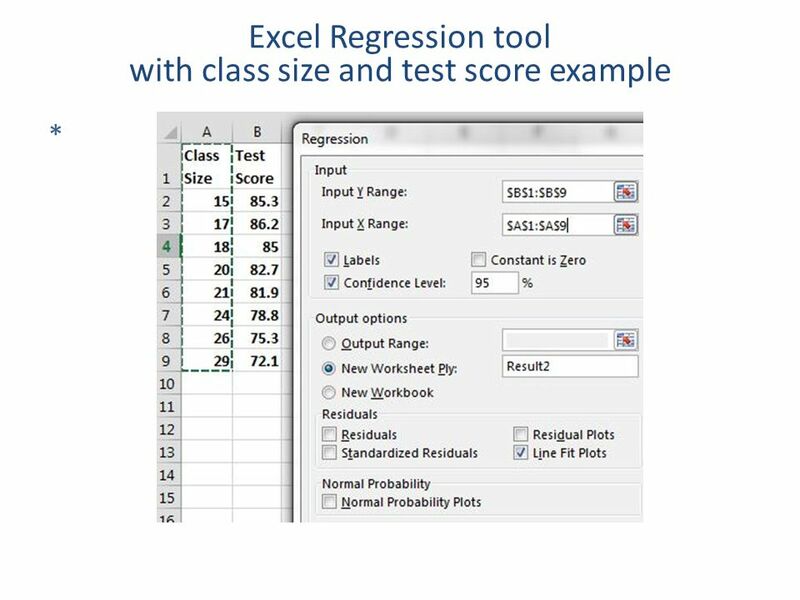 A prediction should not be made with a regression model if… 1.The data do not fall in a linear pattern when graphed on a scatter plot. 2.The correlation coefficient is not statistically significant. 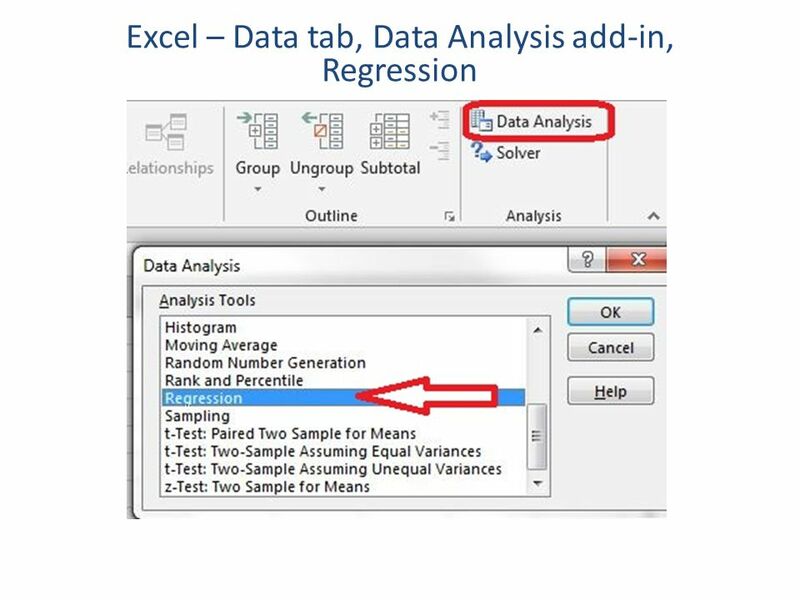 3.You wish to make a prediction about a value outside the range of the sample data. 4.The population is different than that from which the sample data were drawn. 20 HAWKES LEARNING SYSTEMS Students Matter. Success Counts. Copyright © 2013 by Hawkes Learning Systems/Quant Systems, Inc. All rights reserved. 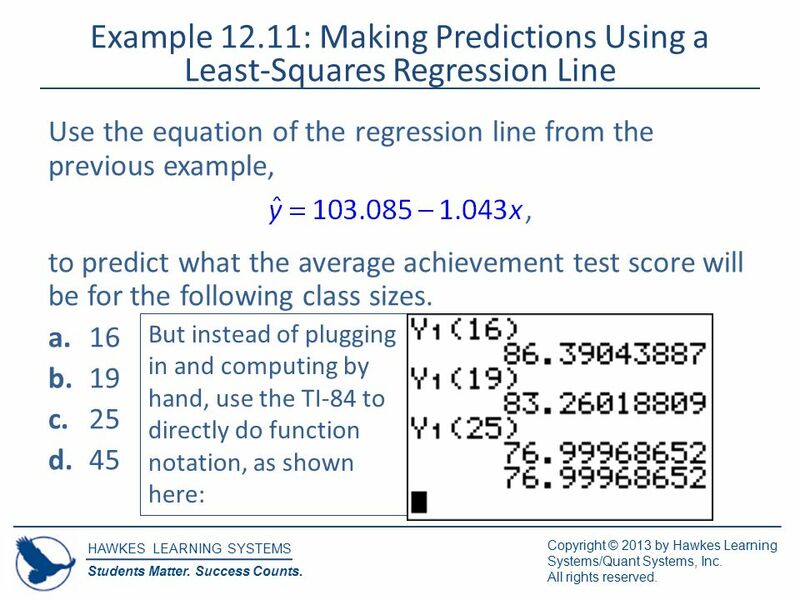 Example 12.11: Making Predictions Using a Least-Squares Regression Line (cont.) Solution d.It is not meaningful to predict the value of y for this class size because the value x = 45 is outside the range of the original data. The original data only considered class sizes between 15 and 29, so we should only predict the average achievement test scores for class sizes within this range. They used rounded-off values for slope and y- intercept and got slightly different results compared to what we did with the Y 1 (16), etc. 22 HAWKES LEARNING SYSTEMS Students Matter. Success Counts. Copyright © 2013 by Hawkes Learning Systems/Quant Systems, Inc. All rights reserved. 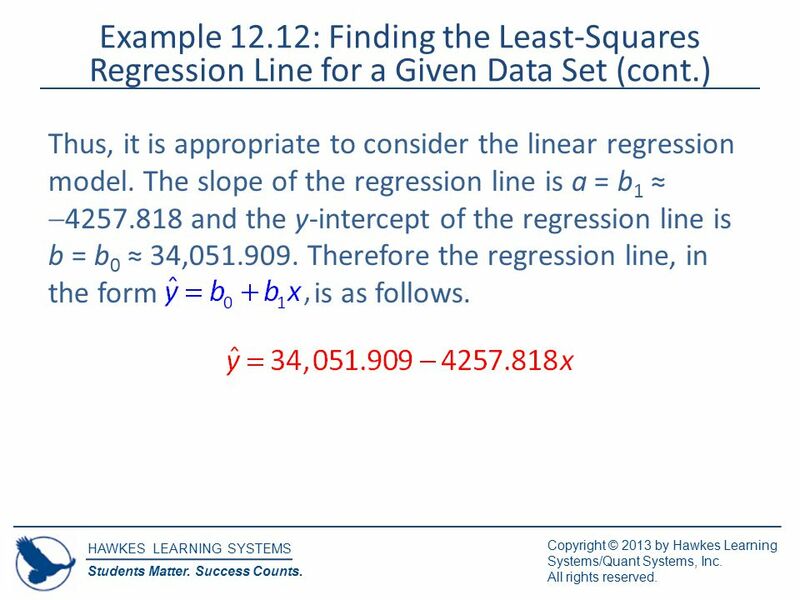 Example 12.12: Finding the Least-Squares Regression Line for a Given Data Set (cont.) Solution To begin, we must determine which variable is the explanatory variable (x) and which variable is the response variable (y). We want to use the age of a used Freelander to predict its selling price, thus age (x) is the explanatory variable and price (y) is the response variable. Use LinRegTTest again and see if you agree with their results on the following slides. 23 HAWKES LEARNING SYSTEMS Students Matter. Success Counts. Copyright © 2013 by Hawkes Learning Systems/Quant Systems, Inc. All rights reserved. 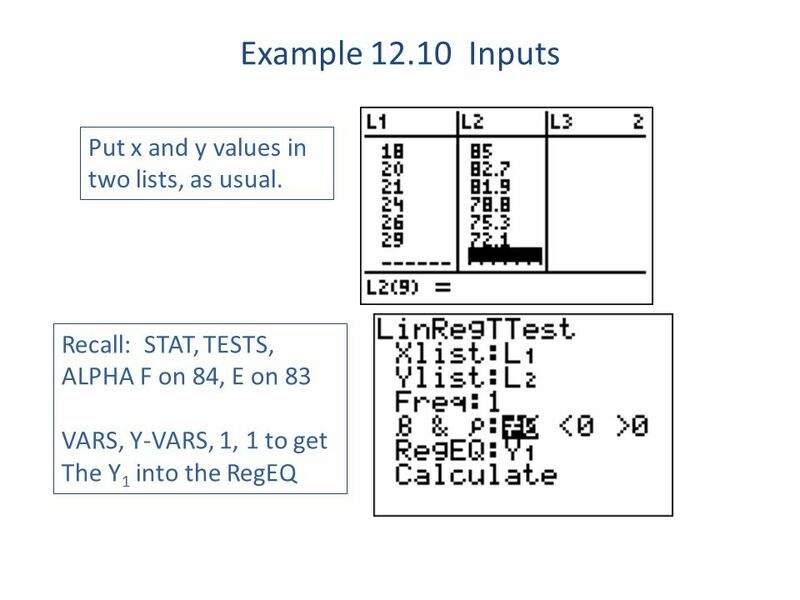 Example 12.12: Finding the Least-Squares Regression Line for a Given Data Set (cont.) 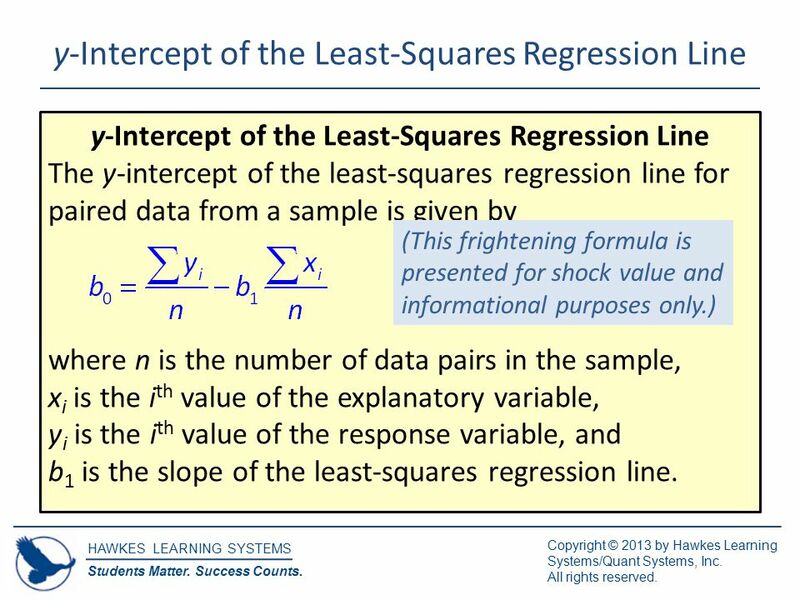 Thus, it is appropriate to consider the linear regression model. The slope of the regression line is a = b 1 ≈  4257.818 and the y-intercept of the regression line is b = b 0 ≈ 34,051.909. Therefore the regression line, in the form is as follows. 25 HAWKES LEARNING SYSTEMS Students Matter. Success Counts. Copyright © 2013 by Hawkes Learning Systems/Quant Systems, Inc. All rights reserved. 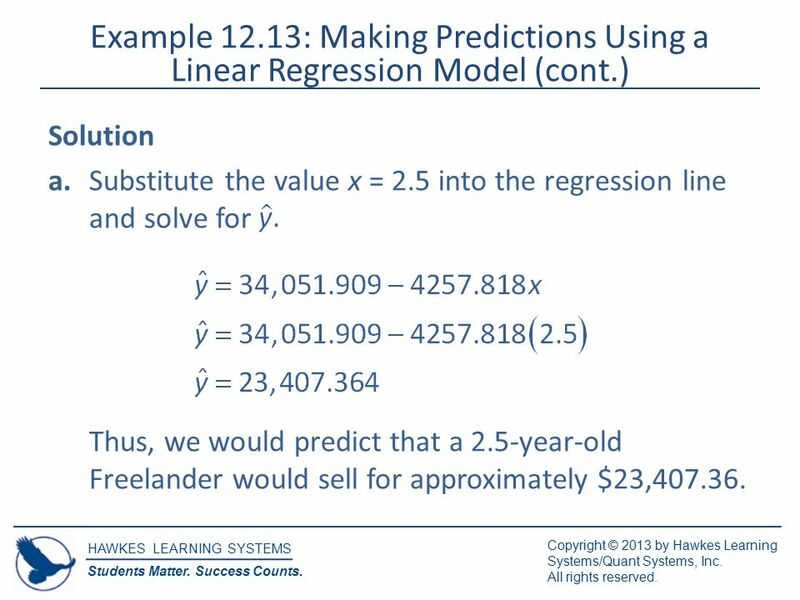 Example 12.13: Making Predictions Using a Linear Regression Model (cont.) 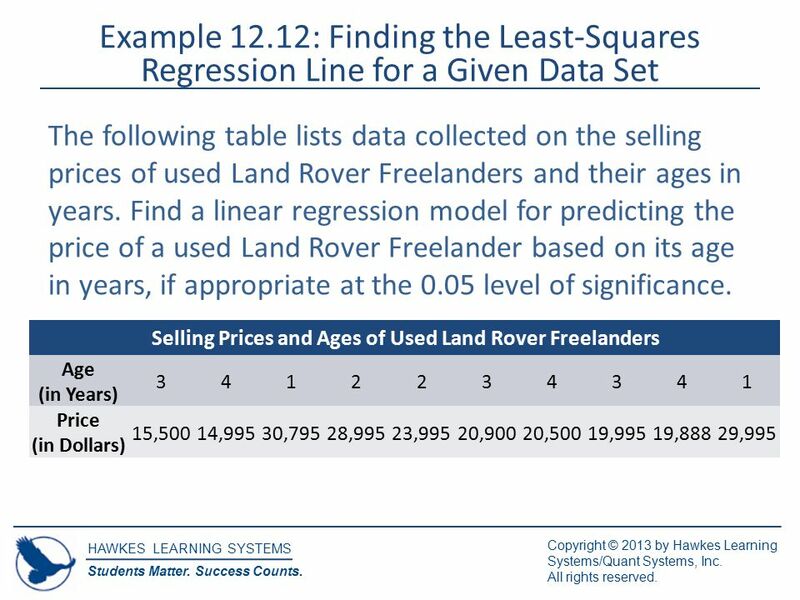 Solution a.Substitute the value x = 2.5 into the regression line and solve for Thus, we would predict that a 2.5-year-old Freelander would sell for approximately $23,407.36. 26 HAWKES LEARNING SYSTEMS Students Matter. Success Counts. Copyright © 2013 by Hawkes Learning Systems/Quant Systems, Inc. All rights reserved. 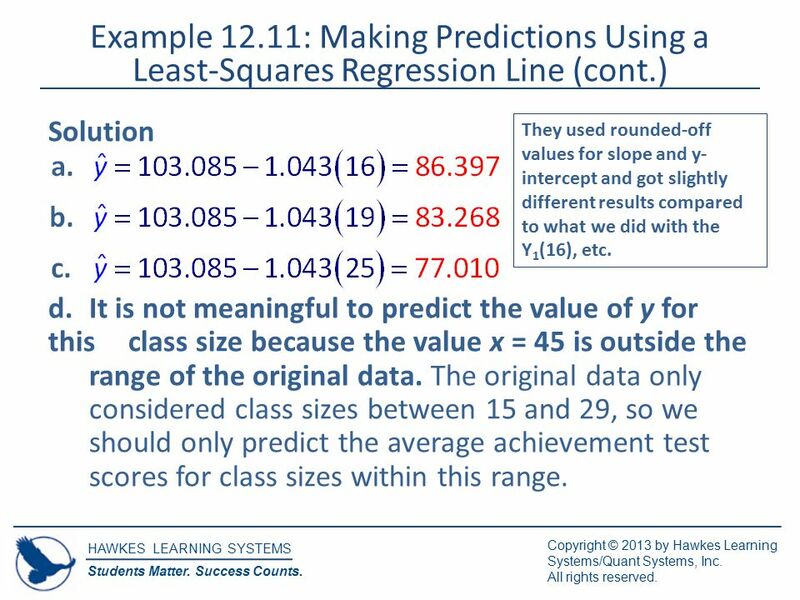 Example 12.13: Making Predictions Using a Linear Regression Model (cont.) 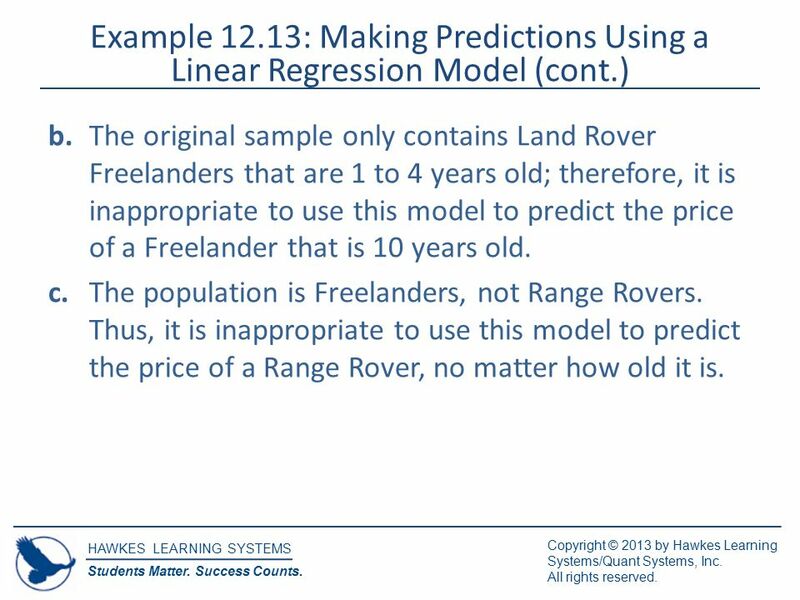 b.The original sample only contains Land Rover Freelanders that are 1 to 4 years old; therefore, it is inappropriate to use this model to predict the price of a Freelander that is 10 years old. c.The population is Freelanders, not Range Rovers. 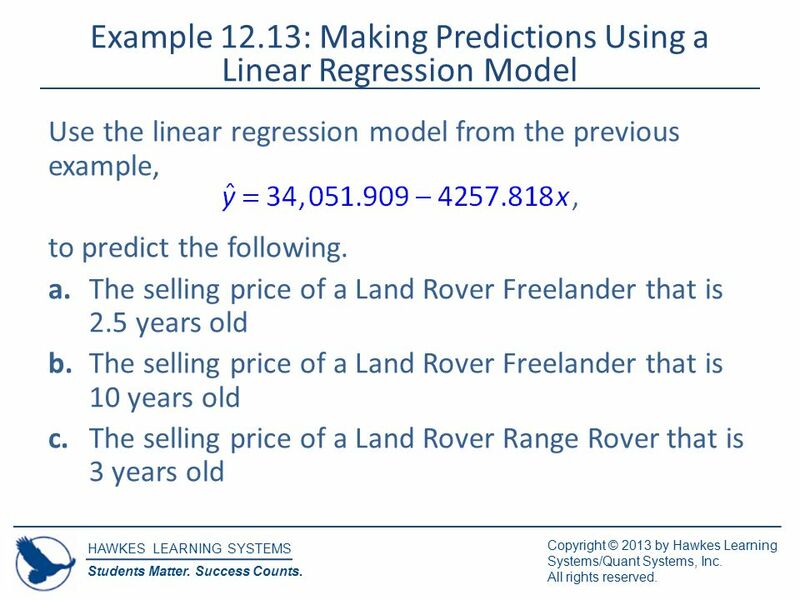 Thus, it is inappropriate to use this model to predict the price of a Range Rover, no matter how old it is. 28 HAWKES LEARNING SYSTEMS Students Matter. Success Counts. Copyright © 2013 by Hawkes Learning Systems/Quant Systems, Inc. All rights reserved. 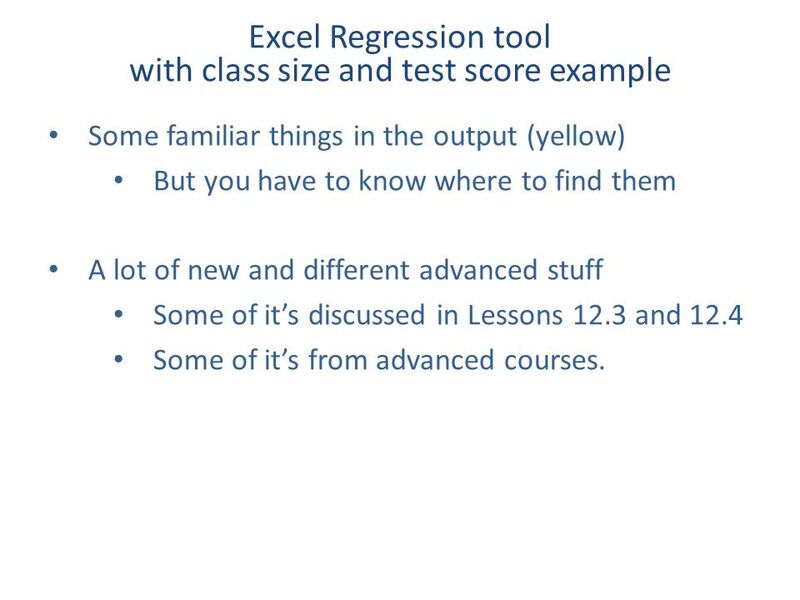 Example 12.14: A Linear Regression Model, Start to Finish (cont.) a.Create a scatter plot for the data. Does there appear to be a linear relationship between x and y? b.Calculate the correlation coefficient, r. c.Verify that the correlation coefficient is statistically significant at the 0.05 level of significance. d.Determine the equation of the line of best fit. e.Calculate and interpret the coefficient of determination, r 2. 29 HAWKES LEARNING SYSTEMS Students Matter. Success Counts. Copyright © 2013 by Hawkes Learning Systems/Quant Systems, Inc. All rights reserved. 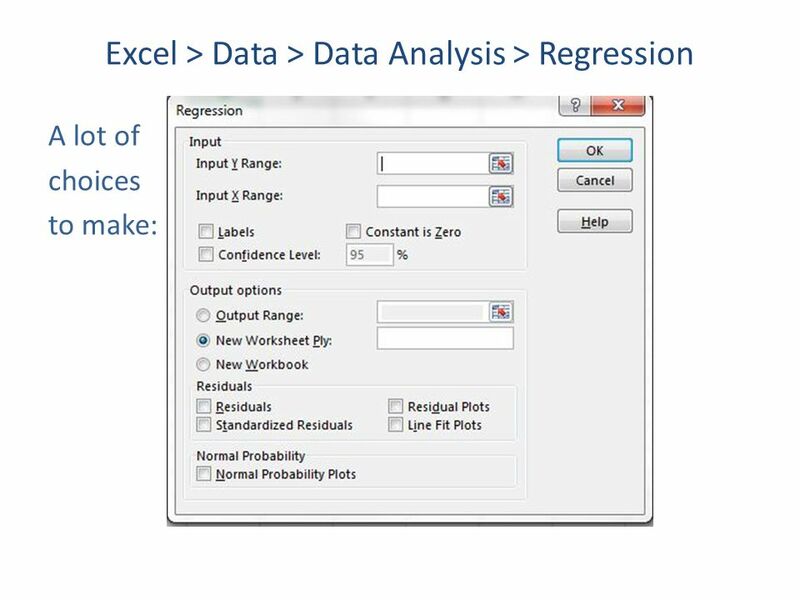 Example 12.14: A Linear Regression Model, Start to Finish (cont.) f.If appropriate, predict the monthly precipitation total in Key West for a month in which the average temperature is 80 degrees. g.If appropriate, predict the monthly precipitation in Destin, Florida, for a month in which the average temperature is 83 degrees. 30 HAWKES LEARNING SYSTEMS Students Matter. Success Counts. Copyright © 2013 by Hawkes Learning Systems/Quant Systems, Inc. All rights reserved. 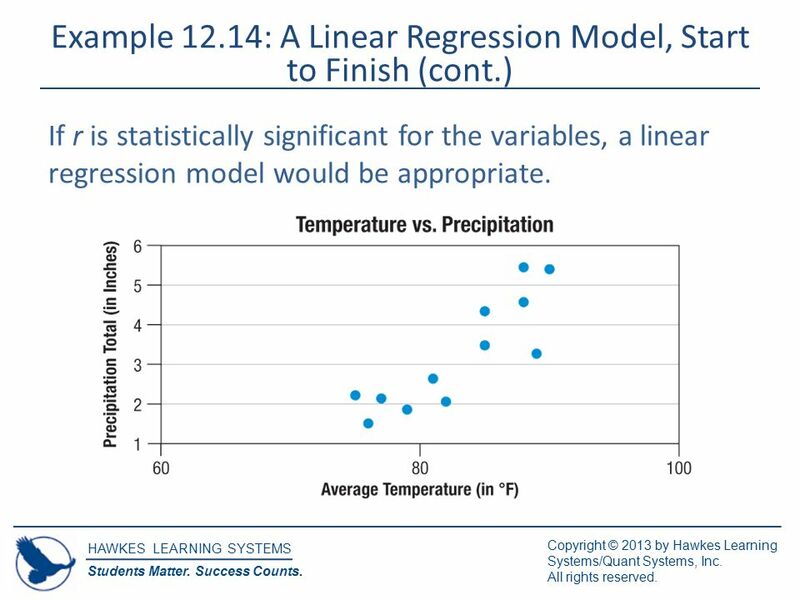 Example 12.14: A Linear Regression Model, Start to Finish (cont.) 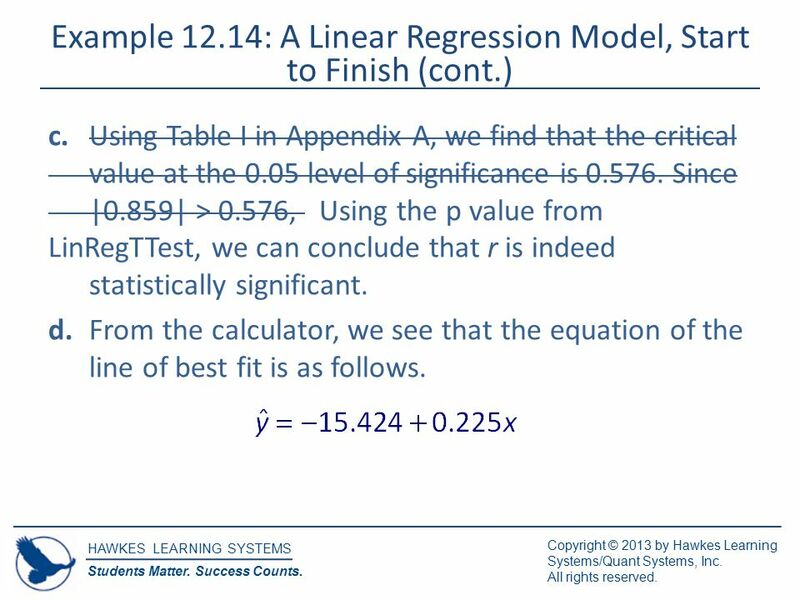 If r is statistically significant for the variables, a linear regression model would be appropriate. 31 HAWKES LEARNING SYSTEMS Students Matter. Success Counts. Copyright © 2013 by Hawkes Learning Systems/Quant Systems, Inc. All rights reserved. 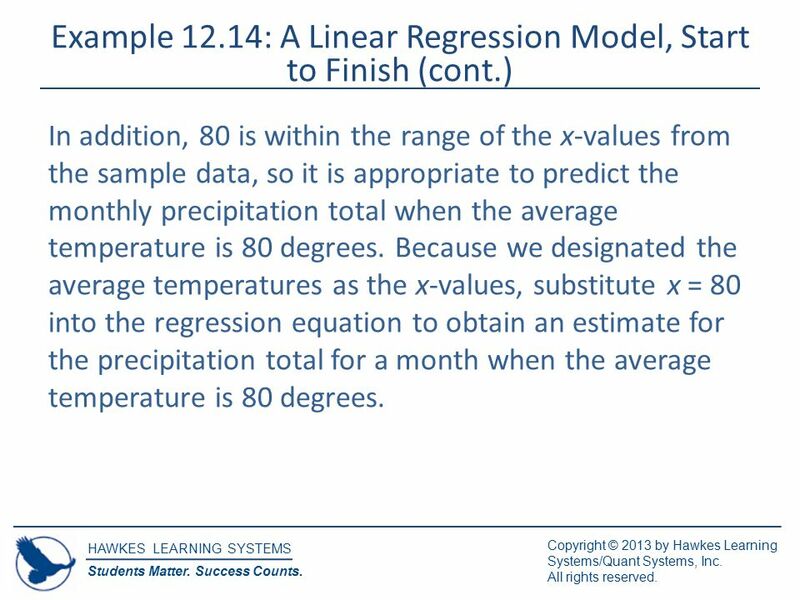 Example 12.14: A Linear Regression Model, Start to Finish (cont.) c.Using Table I in Appendix A, we find that the critical value at the 0.05 level of significance is 0.576. Since |0.859| > 0.576, Using the p value from LinRegTTest, we can conclude that r is indeed statistically significant. d.From the calculator, we see that the equation of the line of best fit is as follows. 32 HAWKES LEARNING SYSTEMS Students Matter. Success Counts. Copyright © 2013 by Hawkes Learning Systems/Quant Systems, Inc. All rights reserved. 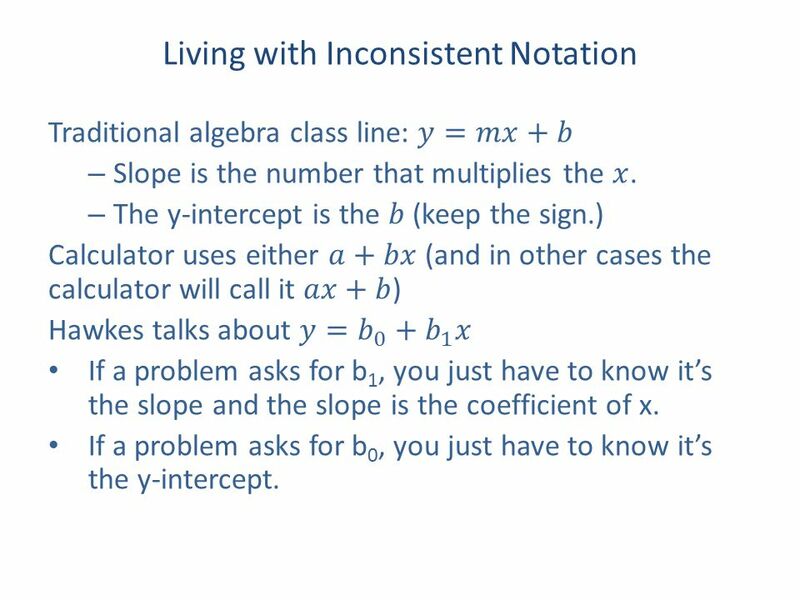 Example 12.14: A Linear Regression Model, Start to Finish (cont.) e.The coefficient of determination is approximately 0.738. This tells us that approximately 73.8% of the variation in precipitation can be attributed to the linear relationship between temperature and precipitation. The remaining 26.2% of the variation is from unknown sources. 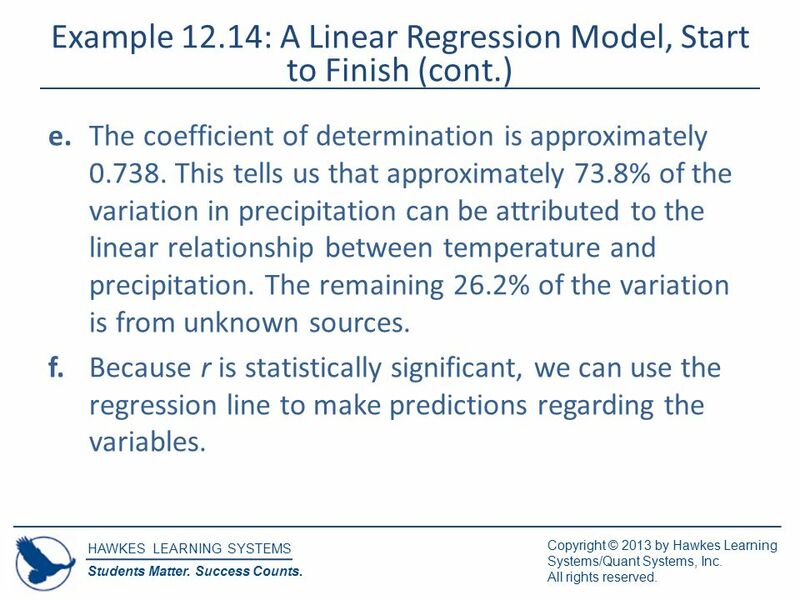 f.Because r is statistically significant, we can use the regression line to make predictions regarding the variables. 33 HAWKES LEARNING SYSTEMS Students Matter. Success Counts. Copyright © 2013 by Hawkes Learning Systems/Quant Systems, Inc. All rights reserved. 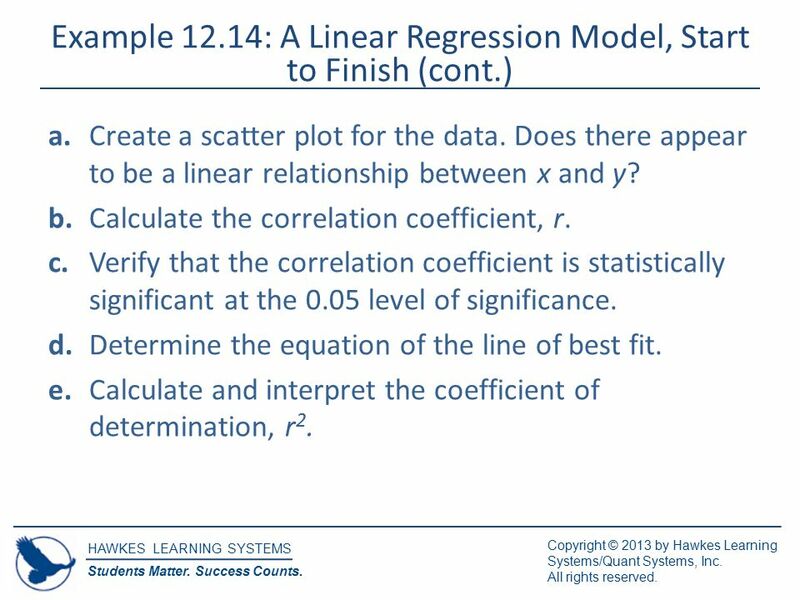 Example 12.14: A Linear Regression Model, Start to Finish (cont.) In addition, 80 is within the range of the x-values from the sample data, so it is appropriate to predict the monthly precipitation total when the average temperature is 80 degrees. Because we designated the average temperatures as the x-values, substitute x = 80 into the regression equation to obtain an estimate for the precipitation total for a month when the average temperature is 80 degrees. 34 HAWKES LEARNING SYSTEMS Students Matter. Success Counts. Copyright © 2013 by Hawkes Learning Systems/Quant Systems, Inc. All rights reserved. 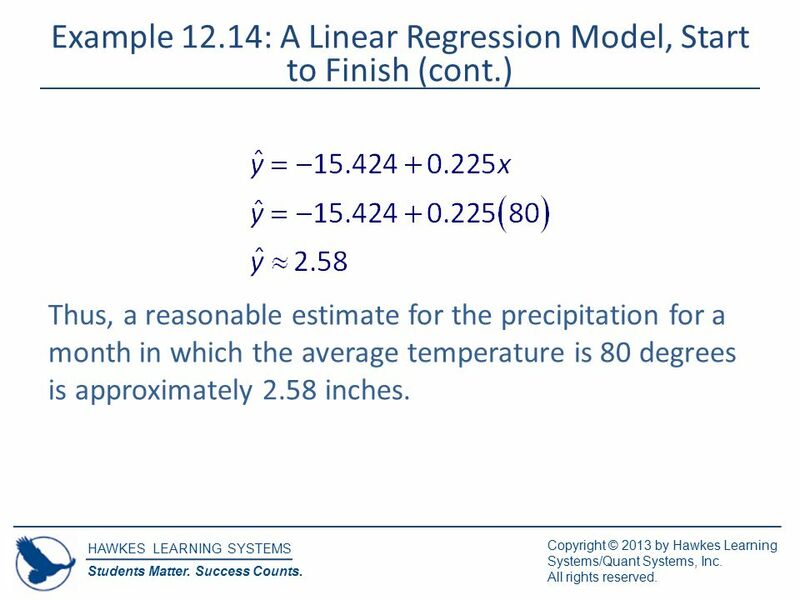 Example 12.14: A Linear Regression Model, Start to Finish (cont.) Thus, a reasonable estimate for the precipitation for a month in which the average temperature is 80 degrees is approximately 2.58 inches. 35 HAWKES LEARNING SYSTEMS Students Matter. Success Counts. Copyright © 2013 by Hawkes Learning Systems/Quant Systems, Inc. All rights reserved. 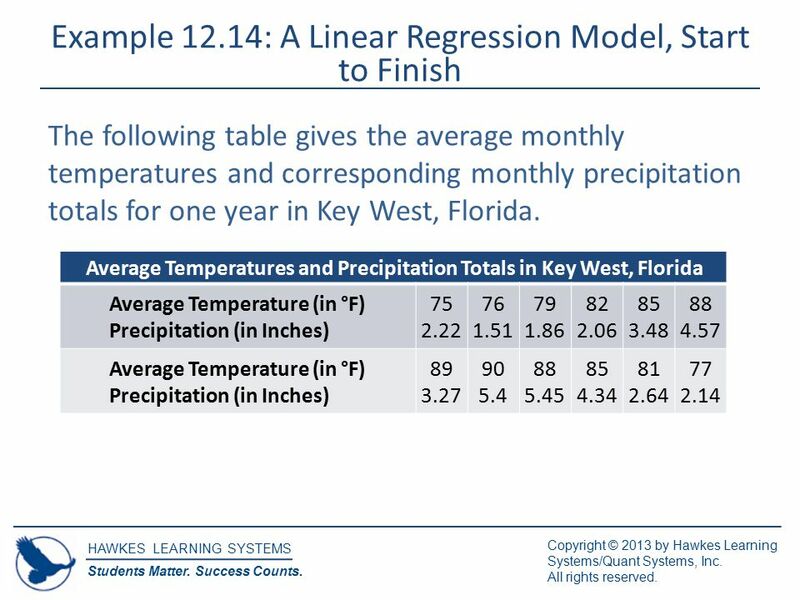 Example 12.14: A Linear Regression Model, Start to Finish (cont.) g.The data were collected in Key West—not Destin, Florida. 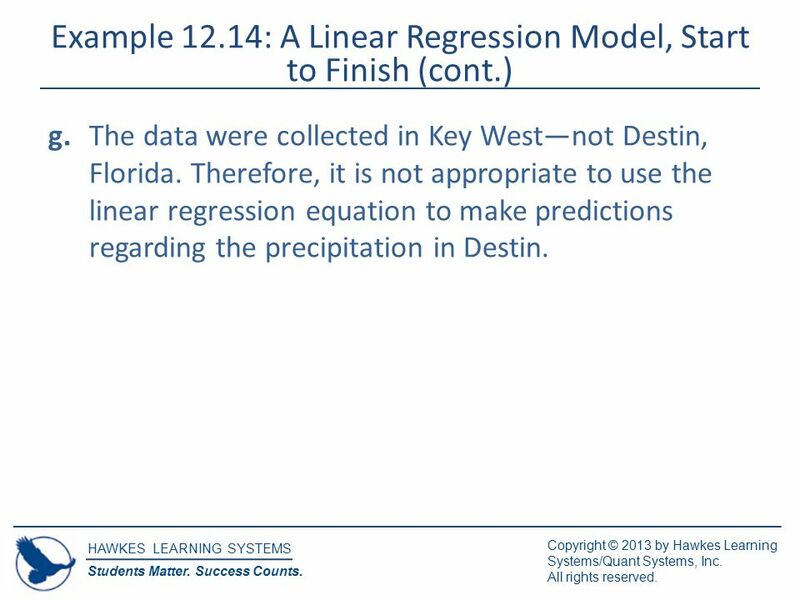 Therefore, it is not appropriate to use the linear regression equation to make predictions regarding the precipitation in Destin. 40 Some familiar things in the output (yellow) But you have to know where to find them A lot of new and different advanced stuff Some of it’s discussed in Lessons 12.3 and 12.4 Some of it’s from advanced courses. Download ppt "HAWKES LEARNING SYSTEMS Students Matter. Success Counts. Copyright © 2013 by Hawkes Learning Systems/Quant Systems, Inc. All rights reserved. Section 12.2." 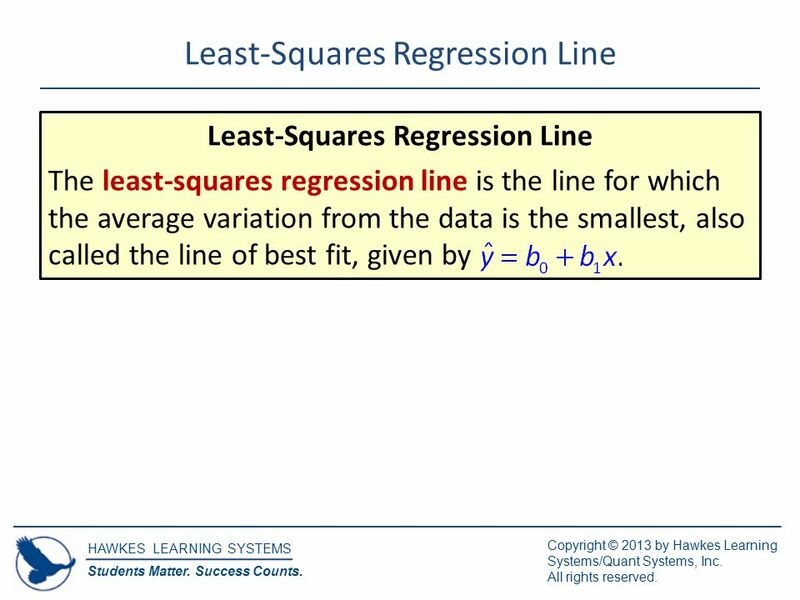 Least-Squares Regression Section 3.3. Correlation measures the strength and direction of a linear relationship between two variables. How do we summarize. Eight backpackers were asked their age (in years) and the number of days they backpacked on their last backpacking trip. Is there a linear relationship. AP Statistics. 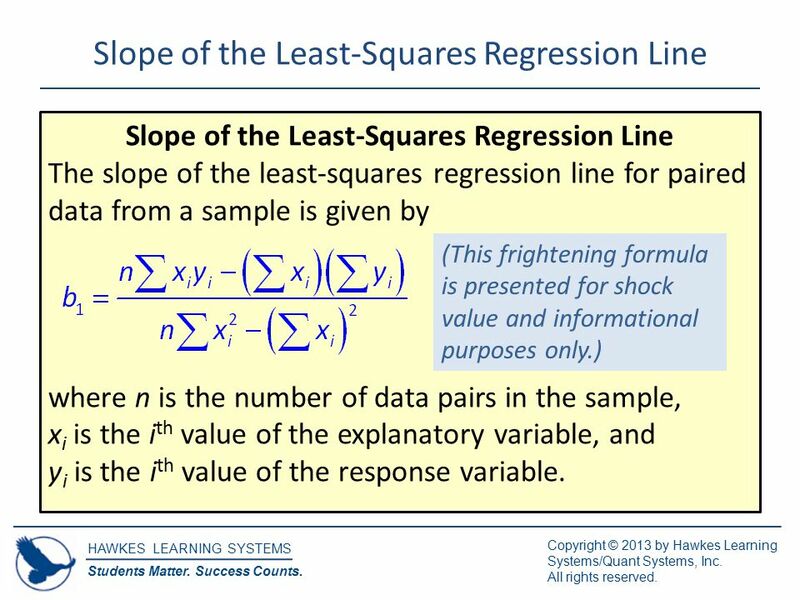  Least Squares regression is a way of finding a line that summarizes the relationship between two variables. 5/16/2015 V. J. Motto 1 Chapter 1: Data Sets and Models V. J. Motto MAT 112 Short Course in Calculus. © The McGraw-Hill Companies, Inc., 2000 CorrelationandRegression Further Mathematics - CORE. 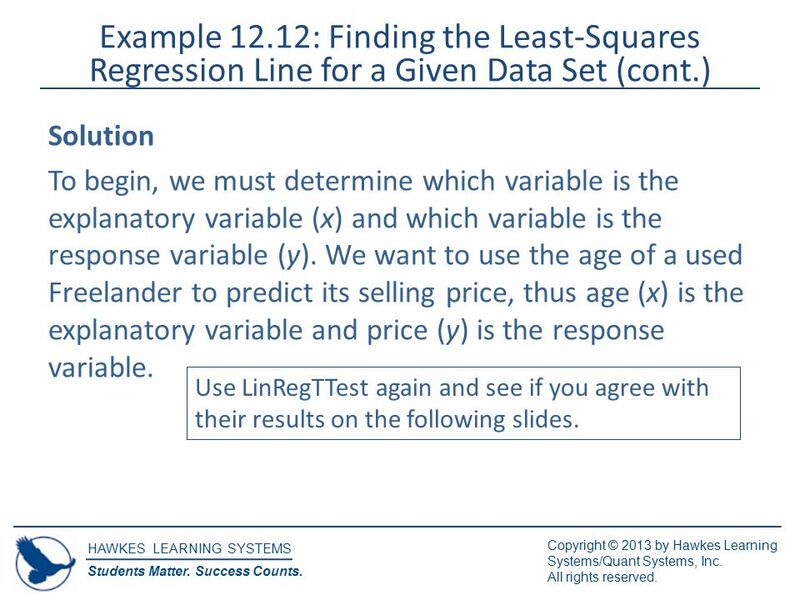 Fall 2006 – Fundamentals of Business Statistics 1 Chapter 13 Introduction to Linear Regression and Correlation Analysis. Math 227 Elementary Statistics Math 227 Elementary Statistics Sullivan, 4 th ed. 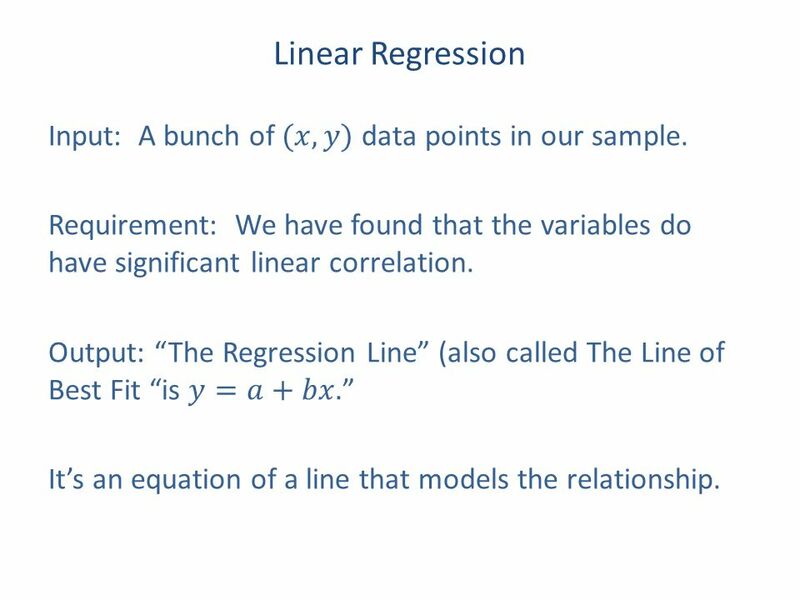 Introduction to Linear Regression.  You have seen how to find the equation of a line that connects two points. 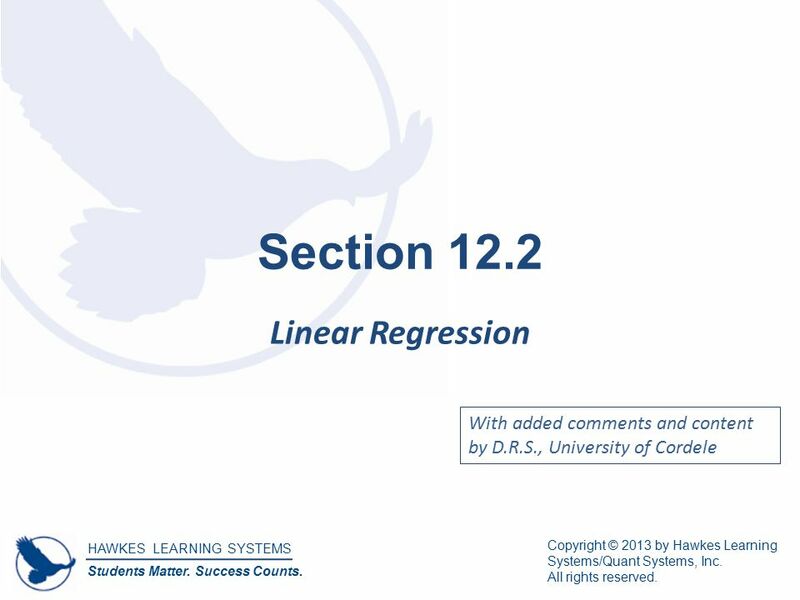 Chapter 12 Section 1 Inference for Linear Regression.